I am in need of some PSP planks I have some verlinden ones and the are alot smaller than I thought and I only have 10 and need about 330 for a Project for Nationals. Can anyone possibly help or point me in the direction who could. Pm or email me. Thanks in advance. Last edited by Thundergrunt; January 27th, 2012 at 01:23 PM. In 1/72, Eduard made something, but that may have been pressed cardboard. Flightpath from the UK makes PSP in several scales. These are etched brass and 330 planks may be quite expensive. Maybe ask David Parkins (from Flightpath) about them and what you need. I have never bought the PSP and I dn't know how many planks are in a package. 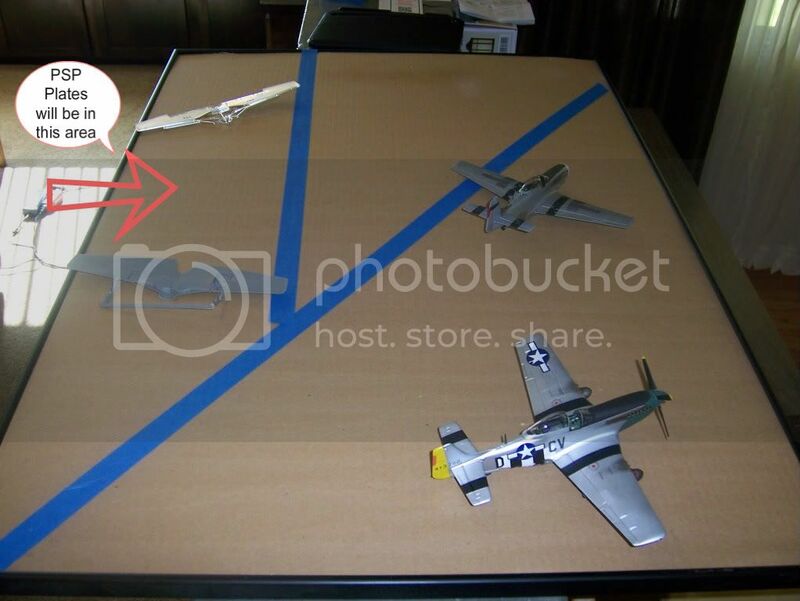 This is the area I am looking to do in PSP,The Area Im trying to do for my RAF Taxi way is about 38" Inches long x 8" wide. but the ticky part is at about 28" it slopes about 45degrees till the point a 38" Ill post a pic so you can see. That would look pretty impressive. Especially if you'd have the 4 Mustangs in markings of the same Group. I had a look at Flightpath's site to check out the other two types of planks that they have. I don't think these neccessarily make it possible to cover the surface more cheaply. A good bundle of cash would be needed to do this with the Flightpath material. The PSP looks awesome though, I don't think anyone makes it better. I wonder what colour the PSP had in WW2. The only PSP I've walked on was rust-coloured. Did it quickly acquire a rusty look? I don't think the USAAF would have been happy with a shiny taxiway in 1943. Were the PSP's originally painted in camouflage colours? OD perhaps? Hey My friend, from what Ive read and seen the came a dark steel color but weathered pretty quicky and had smooth out silver tops from all the movment and such. I have also researched wood planks tied and bound togheter with a thick wire. It might be cheaper and easier than the Flightpath PSP to cover some area with that. DIY ! It´s easy to make as many resin copies as you need for your proyect. I can asits you via PM or e-mail. The pieces assemble just like the real stuff. The instructions are kinda weird because thats not how matting is supposed to be laid. It's supposed to be laid like a "staggered brick" pattern where the edges don't line up. The modern EAF aluminum matting is laid the same way except the modern stuff has "half sections" to make the edges smooth. I've seen Korea/WW2 pics where the PSP/Marsden stuff is left ragged on the edges or just cut off to make the edges smooth. Last edited by John B; March 4th, 2012 at 05:03 PM.